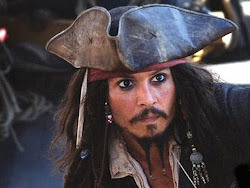 During the many adventures of the pirates of the Caribbean, we come a cross quite a few damsels, all with their own unique personalities and love/hate for Jack Sparrow. We want to know which of these young ladies you like the most? Please vote in our poll and let us know! Now I will share with you which damsels in distress I think are the most interesting. Anamaria and Jack have encountered each other before we first meet her in The Pirates of the Caribbean: The Curse of the Black Pearl, and I don't think they had a very good first impression. Apparently, Jack had stolen her ship a while back. So when Jack comes rolling into Tortuga in another stolen ship looking for a crew, Anamaria joins the lot in order to see Jack again and give him a piece of her mind. She starts out by slapping him. Will: "I suppose you didn't deserve that one, either." Jack: "No, that one I deserved." Anamaria: "You stole my boat!" Jack: "Actually." And then she slaps him again. Esmerelda is one of the few damsels that has never slapped Jack. In The Price Of Freedom she encounters Jack as he is first mate of the merchant vessel, Fair Wind. She had Just taken over as captain of the ship Vengenza from her father, Don Rafeal. Jack warns the captain that he recognizes this ship but he ignores Jack (bad idea) and ends up going crazy because he thinks that it's improper for a woman to be captain. (Another Bad Idea) Esmerelda gets annoyed and stabs him. However since she has met Jack and (of Course) fell in love so she did not take all of the Fair Wind's cargo. She is also nice later in the book when Jack had just fought and beat a rogue pirate. She sends her men to help Jack's men repair his ship, the Wicked Wench. I suppose she is a bit nicer then a certain damsel that slaps on sight. . .
Angelica and Jack also go pretty far back beyond the movies. The first meet when Jack enters into her convent when she's preparing to be a nun. They fell in love, and then he broke her heart by leaving. They meet again in a bar in The Pirates of the Caribbean: On Stranger Tides. As they sail together on the Queen Anne's Revenge they pick up their love interest again. But it fails when Jack saves her life (???) and then dumps her on an island as she pretends to be pregnant. But as she's on the island, Jack's voodoo doll washes up on the shores. What will she do with it next? but in The Pirates of the Caribbean: At Worlds End we learn that she is a creepy enchanted obeah goddess who used to have thing for Davy Jones. (Imagine what their kids would look like?) But their love ended so long ago when Jones stopped fulfilling his duties ferrying souls to the other side and trapped her in human form. So she turns on him by helping the Brethren court defeat him after they have released her from her human bonds. Wow. Where to begin with this one? She's in more of the movies than any other woman and the plays quite a significant role in each one. If you haven't noticed in any of my other posts, I love to hate on Elizabeth. But in reality, I think she's a great character to include and I missed her in The Pirates of the Caribbean: On Stranger Tides. Of course, her constant tone of superiority makes me want to punch her but she makes the movies quite interesting with all her romances. (There are too many of those to list here, so if you want more about her love affairs click here) But in the end she marries Will Turner and raises his son, also named Will Turner.